Preheat oven to 350°F. Combine everything except topping ingredients in a medium bowl and stir until everything is well incorporated. Spoon into a greased casserole dish. For the topping, combine brown sugar, flour, pecans and butter. 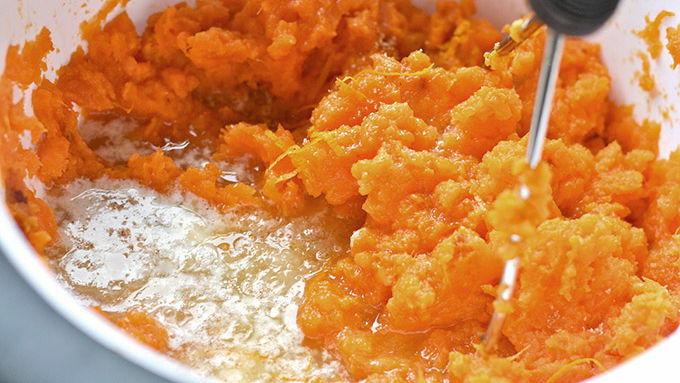 Sprinkle over the top of sweet potatoes. 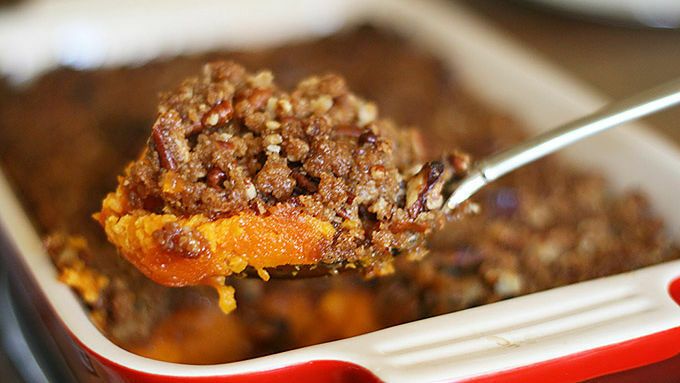 Prepare sweet potato mixture and spoon into greased casserole. Cover and chill overnight. Remove from refrigerator 30 minutes before baking as directed above. 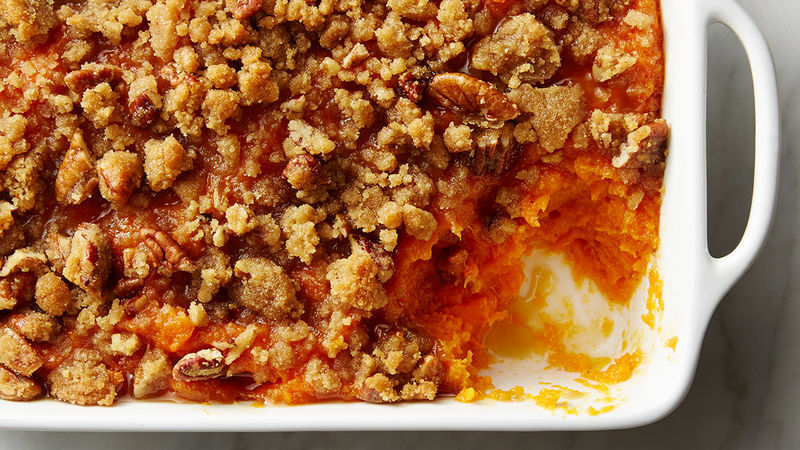 This Thanksgiving, add a grown up twist to your sweet potato casserole. So good, it'll become a tradition. When I was a kid, I couldn’t get enough of the candied yams at Thanksgiving. You know, the ones in heavy, sugary syrup and topped with marshmallows. Basically straight sugar. Of course I liked them! Now that I’m a bit older, I still like my sweet potatoes candied, but I prefer a little less sugar and a more refined dish. Don’t get me wrong; you could still eat these for dessert if you wanted to. But for some reason I feel a little less bad about it. I adapted this recipe from a friend of my mom’s. The original one called for rum and a ton of sugar. I have played with this recipe and perfected it over the years, and now my family consistently asks for it at Thanksgiving. My final version uses Grand Marnier™ and maple syrup. A match made in heaven! The Grand Marnier™ is the secret ingredient here. It gives it a slightly citrus, deep flavor that I just love. (I use it in my cranberries at Thanksgiving as well.) Don’t worry; the actual alcohol cooks out of it, leaving behind only deliciousness. I definitely recommend using fresh sweet potatoes (garnet yams), and cooking them with your method of choice. I like to roast them in the oven for about an hour until easily pierced with a fork, but you could also boil them. This can even be done a day or two ahead of time. 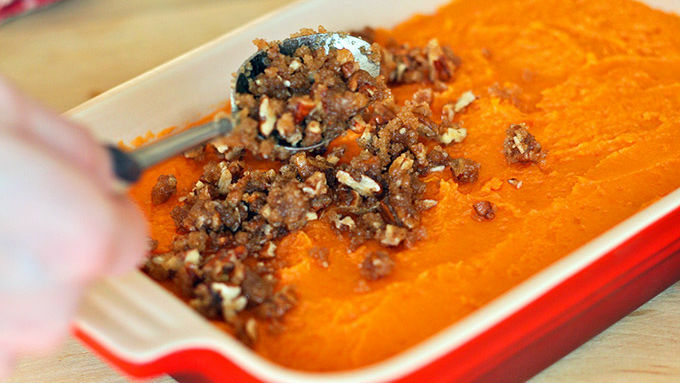 Another do-ahead step: Prepare sweet potato mixture and spoon into greased casserole. Cover and chill overnight. Remove from refrigerator 30 minutes before baking as directed above and sprinkle with topping. Eat it with your turkey, or for dessert, or BOTH! Happy Thanksgiving!